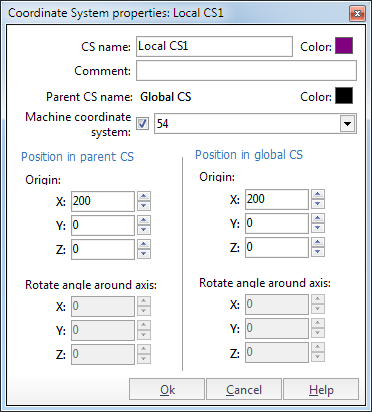 To open the coordinate system properties window press the button on the coordinate systems panel. The <Name> of the coordinate system can be changed in this window, as well as its <Color> and <Comment>. To move an original point of the active coordinate system, define the displacement value for the <X>, <Y>, <Z> axes. Displacement is performed relative to the <Parent> or <Global> coordinate system. <Rotate angle around axis> can not be changed and shown for information only.